Samoans have constructed many types of canoes, each designed for a specific purpose such as the “Paopao”, which is used for fishing within the reef areas and the “Va’aalo”, which is a bigger fishing craft used outside reef areas and for short distance travel. The Samoas arguably represent the largest population of Polynesian people and they take pride in a strong culture that has survived outside incursions amazingly well.For centuries, fine mats, woven from the leaves of the pandamas tree, have been the symbol of wealth and prosperity. To this day, they are equated to the many hours, indeed sometimes years, of work put into the diligent weaving of the mat. In this way, the intrinsic value of the work in the mat is valued so highly, that for many years the mats were used for money and barter. Today, they are given mostly as gifts at special occasions like marriages, and to the bereaved families at funerals. There is however a wide variety of handicrafts and artifacts made by local craftspeople. Tapa cloth made from the bark of the mulberry tree, dyed with natural local dyes can be readily found. Shell jewelry is also of a high standard and inexpensive. The carvings are authentic and of very good quality. The Cook Island women are renowned for their craftwork particularly their Tivaevae. These are handmade bedspreads mainly featuring brightly coloured flowery patterns. Local women make and reserve these for special occasions. The traditional island cloth, tapa is enjoying a revival in its popularity. It is produced by beating the bark until the required texture is obtained and is decorated with traditional cultural patterns. While it’s lack of comfort means it is no longer used for garments, it does make – and is often used for – a fabulous wall hanging. The pareu is the modern day garment regularly in use in the Cook Islands. It is a length of cloth about 2 metres long, which can be tied around the body in a variety of ways. Pareus are a practical garment for the hot climate, the light colourful fabrics wash and dry quickly and are equally good as picnic cloths or convenient towels. Dresses, skirts and blouses of the same material are also popular with women, while men prefer the island style aloha shirts. Arts and crafts are readily available in the Cook Islands with the most popular souvenir items being the wooden carvings of the phallic demi-god ‘Tangaroa’. Authentic handcrafts often come from islands, which specialise in a particular item. The omate shell and seed hat bands come from Mangaia, while finely woven pandanus mats come from Pukapuka. Materials used in weaving are palm and pandanus leaves, which are so well processed that the end product often has the appearance of a linen fabric. One of the finest examples of local handicraft is the rito hat. These hats are available to tourists. They are a vital part of every Cook Islands woman’s dress. Woven baskets are always a popular item and are made from the fibre of coconuts. The art of pottery brought into the South Pacific by the gifted and versatile “Lapita” people survived in Fiji but failed in Tonga, Samoa and east Polynesia on account of the lack of suitable clay. The Fijians still make pottery. But the pottery of recent historic times has degenerated considerably from the ware made by the first settlers. 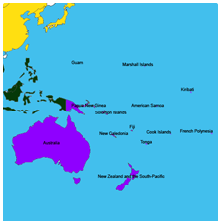 In art as well as in other domains, Eastern Polynesia formed a region apart. The wooden or stone anthropomorphic statuettes called “ti’i” or tiki had a religious significance, whereas articles for useful or ornamental purposes were simply given a decorative design. The famous tiki, the Marquesan name for the “ti’i” of Tahiti, is found in various situations, and those decorating combs or the handles of fans are very finely carved. Those that were a little larger and made of wood were perhaps already used for religious purposes. They are to be found as posts, as individual statuettes averaging 30 cm in height, or as components of canoes. The most coarsely fashioned stone or coral “ti’i” were usually found on the marae or at the boundary of sacred land. In the Austral Islands, where the decorative arts no doubt were most characteristically Polynesian, important articles, usually made of wood, were carved with fine geometric motifs. Human forms, especially on drum bases, are completely original and have nothing in common with the famous tiki, which seems today to be the only symbol of Polynesian art. Guam is presently an Unincorporated Territory of the United States. On August 1st 1950, the Chamorros of Guam were granted the right of civilian rule through the Organic Act of Guam. The famous handicrafts of Guam include carved love stick, bead bracelets and necklaces, woven baskets, marmars (flower necklace that goes around your forehead), woven traditional stars and shapes with shells and shell necklaces. Weaving is a skill as well as an art, and the Kiribati women are very fine weavers. Designs used in weaving are family property, and mothers passed the skill on to their daughters. Besides weaving fine mats for sleeping, they also make baskets, hats and fans. Pandanus leaves are used, and sometimes coconut leaves. The application of easily procured commercial dyes is not unknown today, no doubt in preference to local dyes which are prepared much more laboriously. The main craft items of Marshall Islands include baskets, breadfruit peelers, canoes, coasters, fans, hats, headbands (wut), jewelry, mats, obong, purses, stars and stickcharts. Marshallese baskets are one of the major forms of handicraft. These exist as open baskets and as baskets with a lid. Specialised forms are hand bags and purses. Hats are a comparatively new form of handicraft. In pattern, weaving and ornamentation the hats follow the mats. Woven hair ornaments are a comparatively new handicraft development. The normal ornaments would have been headbands (wut) made from flowers woven around a solid pandanus core. Later, flowers were substituted by wool. The Wall hangings (Obong) were introduced as a handicraft item during the Japanese Mandate Period. Marshallese purses or handbags are a more recent form of handicraft, which enjoys increasing popularity. New Caledonia has an age-old culture of archaeology and the Kanak arts and traditions. Melanesian sculptures, totems, funeral masks, as well as many objects depicting all the aspects of this society: pottery, ornaments, jewellery made of jade or shells, Kanak coins, spears, models of outrigger canoes, roof poles, etc. are some of the notable craft items of New Caledonia. Papua New Guinea: The basis of primitive art is religion. It renders the divine or supernatural visible thereby enabling man to live in close contact with it and be secure, virile, fertile, and a successful gardener and hunter. Hence it’s images are found not only on ritualistic or ceremonial objects but also on more ordinary, everyday ones such as house posts and gables, weapons, implements and jewellery. Generally stone axes and adzes were for rough work; skins of rays, lizards, and sharks were used as abrasives for smooth work along with pieces of coral and shells. The final finish varies greatly from place to place. In the Sepik the substances used most often to cover artifacts is mixture of clay, burnt lime, and (tigaso) tree oil (which is used to rub into the wounds incurred during the scarification – initiation – ceremony). In the Huon peninsula and Milne Bay areas a pig’s tusk is used to’ polish ‘ the item whilst most Papuan Gulf items are painted. Paints are applied throughout the country with the fingers, chewed or frayed ends of plants stems, or with feathers; charcoal for black; soapstone for grey; ochres for yellow and brown; and plants for red and blue. Solomon Islands carvings go back to the dawn of time. They have their roots deep in the culture of the islands and their people. They were, and still are, part of their religious, economic and domestic lives.The craftspersons of Solomon Islands produce highly polished carvings with distinctive shell inlay work. The best know of these is Nguzu Nguzu, the head of a sea god, which used to be attached to the prow of a canoe. Sharks and dolphins are also carved in the Western Province, and attractive feather fans are made by the Gilbertese (I-Kiribati) people who settled there in large numbers. A form of shell or stone money using ossilised clam shell was also produced by the craftspersons of this country. War clubs made on the island reflect the violent nature of the island. Useful Ioya cane baskets with black and brown decorative deisgns also come from this island, along with very attractive combs with finely woven red and yellow designs. Turtle shell jewellery is an interesting example of craft developed by expatriates from Marau Sound using Solomon Island materials. Dance in Tonga has traditionally been an important art form, and this becomes evident during exhibitions of Tongan dancing performed for visitors on the waterfront. The songs and dances describe the legendary exploits of the King’s ancestors. In ancient times, dramatic events were immediately translated into songs and dances, and it is through this tradition that the history of the Tongans is passed down to successive generations. Weaving of cloth from the bark of the Pandanus palm is a native craft, and one can lso pick up beautiful baskets and finely woven mats. Besides canoe racing and soccer, traditional pursuits such as beautiful and intricate dances and making figures from string are also practiced. For the really important occasions and to honour particular achievements, chants for one to four voices are popular. Crafts are traditionally handmade and make use of local materials like palm leaves, pandanus leaves, sea shells, tortoise shells and coconut wood models of Gilbert Island houses and canoes.